Cold Steel Marauder(39LSWB) High quality Cold Steel knives, throwing knives, tactical knives. Inspired by the formidable combat knives of WWII and honoring the name of Merrill's Marauders – also known as Code name Galahad, the United States renowned long range, deep penetration assault unit within the South East Asian theatre of conflict – our Marauder Bowie is rugged, relentless and reliable. A true battle ready Bowie. Its huge extra broad razor sharp Japanese AUS8A blade, with its continuously curved cutting edge, deep wide blade bevels and formidable clip will cut, hack, shear, chop, slice and pierce with equal ease. During our intensive and torturous performance testing of this new Bowie our company President simply uttered one word: "Beastly". The Marauder's generous full tang is encased in a double quillion sub hilt Kray-Ex™ handle that is impervious to the elements and incredibly comfortable. Its sturdy and versatile Secure-Ex™ sheath allows the knife to be fastened comfortably and securely on a belt or pack, or LBV. 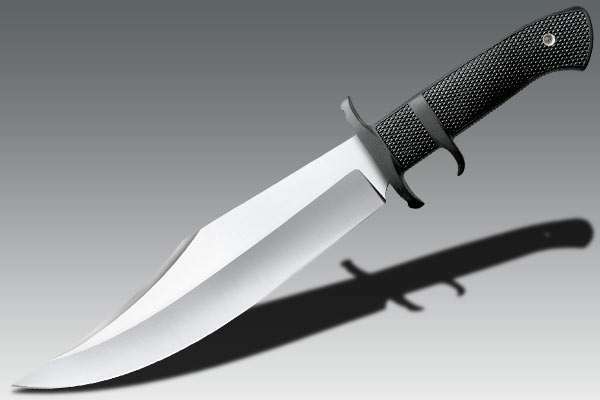 Extensively field-tested, our Marauder shines as both an intimidating combat Bowie and a reliable hunting knife. Cutting through brush, performing camp chores and dispatching game effortlessly.